Albuerne, M., De Lavallina, J., Esteban, I., Naves, F. J., Silos-Santiago, I., Vega, J. A.
Albuerne, M., López, S., Naves, F. J., Martínez-Almagro, A., Represa, J., Vega, J. A.
Del Valle, M. E., Ciriaco, E., Bronzetti, E., Albuerne, M., Naves, F. J., Germana, G., Vega, J. A.
Dr. Albuerne has a son from his first marriage, Marcelino Andres. In 1991, he married Barbara Jennings who was a nurse at Saint Agnes Hospital, originally from Ellicott City. They have 2 great kids, Monica Jean and Adam Jennings. Besides maintaining his busy practice, Dr. Albuerne is involved with the Boy Scouts. He is an Assistant Scout Master, Merit Badge counselor and Eagle Dad. He’s a Board Member of Friends of Boy Scouts Troop 615, Inc., a non-profit entity which supports the Scouts, the church, and the community. He’s also involved with the Knights of Columbus through his church. His hobbies are, but not limited to, hunting, fishing, and working with his hands. As empty nesters, Dr. Albuerne and his wife are rediscovering life for two. They enjoy boating, traveling, cooking, eating, and spending time with family and friends. Born in Cuba, Dr. Albuerne came to the USA via the Freedom flights with his family in 1966. After a short stay in Miami, he moved to Baltimore, where his father started his internship at Bon Secours Hospital. 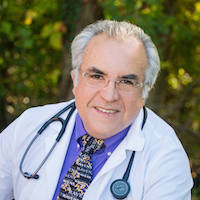 He completed his primary education, and in 1975 moved to Miami, FL, to begin his pre-medical education at the University of Miami and subsequently Medical School at Ross University. Dr. Albuerne came back to Baltimore to complete a residency in Internal Medicine at St. Agnes Hospital, after which he decided to make Maryland his home. When he started in private practice, he was very upset with the general neglect, disregard, and often abuse of the elderly. He decided to pursue a sub-specialty in the emerging field of Geriatric Medicine. He obtained his board certification in Internal Medicine and Geriatric Medicine.